62/82 Music Fest August 25th! Gates open at 5, Music will start at 6pm! Tickets at the gate are $20 and Coolers at the gate are $20 NO GLASS CONTAINERS. ATM’s will be on site, Cash only at the gate! Keep listening to 105.7 The Red Dirt Rebel for more details. 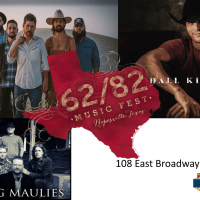 Click here and get your tickets for The 62/82 Music Fest Now!